Our teams are making their initial assessment but the needs in Beira massive - the hospital and medical centre where we were treating people living with HIV before the cyclone hit are now only partly functional. Despite being severely damaged, the hospital has treated more than 1,500 wounded, which gives an indication of how serious the situation is. MSF emergency coordinator Gert Verdonck arrived in Beira, Mozambique on 19 March, and shares his first impressions of the situation on the ground. The first thing you see when you arrive is destruction - and a lot of water. We hear that the situation outside the town may be even worse, but in the limited time since we got here, we've focused on trying to understand the situation and needs in this city. 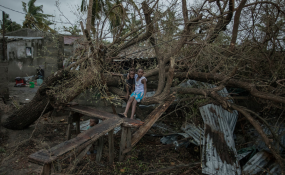 There are some 500,000 inhabitants and most houses are damaged or destroyed. It's hard at this stage to have a clear picture of the medical needs. Actually, it's hard even just to get to the health centres, because the roads are destroyed or because the health centres themselves are destroyed. I think that's our biggest challenge right now. And it's also a challenge for the Ministry of Health, who are trying to re-establish healthcare as quickly as possible. Respiratory diseases are a worry, too. It is still raining right inside people's houses, so pneumonia is going to be a problem. And many people are gathered in schools or churches, where respiratory diseases can easily spread. On top of all of that, there's the issue of how to treat people who fall sick - with so many health centres damaged or destroyed. But really, and I want to stress this point, it is too early to paint a clear picture of the exact health needs. We'll start responding to the main needs we see, but at the same time we'll be developing a better understanding day-by-day of where our assistance can have the most impact, and we'll scale up our response accordingly.